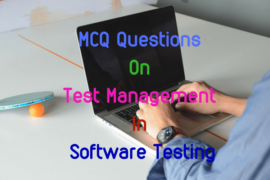 This set of multiple choice questions on streams in java includes collection of MCQ questions on the methods used in InputStream, MarkableStream and OutputStream class in Java. 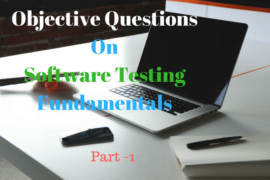 It also includes objective questions on the methods of file input stream and fileOutputStream, ButteredInputStream and BufferedOutputStream, DataInputStream and DataOutputStream along with Reader and Writers classes. You will also find MCQs about RandomAccessFile, StreamTokenizer and other stream classes like object streams, piped streams, pushback streams and filtered streams. 1. The …………………… package contains a large number of stream classes that provide capabilities for processing all types of data. 2. State whether the following statements about the stream in Java. i) The two basic streams used are the input and the output streams. ii) Filters are used to read data from one stream and write it to another stream. 4. The OutputStreams includes methods that are designed to perform the following tasks. 5. Which of the following method(s) not included in InputStream class. 6. Which of the following methods not included in OutputStream class. 7. The class DataInputStream extends …………………….. and implements the interface DataInput. 8. The method …………………., force writes whenever the data accumulates in the output stream. 9. The DataInputStream and DataOutputStream classes are …………………….. streams that allow the reading and writing of java primitive data types. 10. The ……………………… class provides the capacity to read primitive data types from an input stream. 11. Which of the following is/are the methods of the DataOutputStream class. 13. Which exception is thrown by the read( ) method of InputStream class. 14. The ……………………… method of the BufferedReader class is used for reading lines of text from the console, the file or other input streams. 15. ……………………. class is used to increase the efficiency of input operations. 16. State whether the following statements about DataInputStream class are True. i) readBoolean( ) reads one byte and returns true if that byte is nonzero, false if it is zero. ii) readByte( ) reads a byte as an 8-bit signed value. iii) readChar( ) reads a unicode character. 17. The ……………………. class implements the DataInput and DataOutput interfaces for performing I/O using the primitive data types. 18. The class ………………………. is a subclass of object class which can be used for breaking up a stream of text from an input text file into meaningful pieces. 19. Combining two or more input streams into a single input stream can be achieved using the ………………. class. 20. ……………….. streams provide functionally for threads to communicate and exchange data between them. 12. D) an interface that defines……..